Pocketwatch Games, the studio behind Monaco: What's Yours Is Mine, has significantly overhauled its next game. Formerly going under the codename 'Armada,' the game is now called Tooth and Tail and this RTS comes with a completely overhauled art style. Andy Schatz, the man behind Pocketwatch Games, has been working diligently on his next project, codenamed Armada. It hasn't always gone swimmingly, as the game has had to go back to the drawing board a few times. But today, Schatz released some completely new art assets, as well as a new title. The former Armada will now go by the name Tooth and Tail. 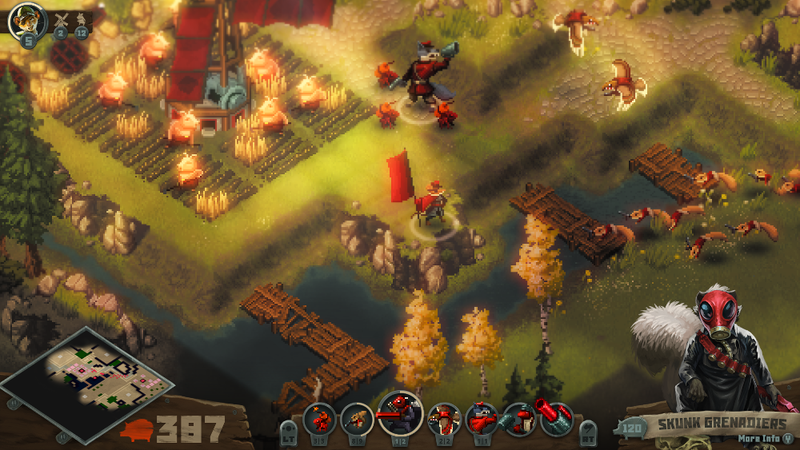 "Tooth and Tail is what we call an Arcade-style Real-Time Strategy Game," explained Schatz on the Pocketwatch blog, "which means that it’s easy to learn, simple to control, and quick to play (5-12 minute matches). TnT is a game for people who want to focus on strategy, not micro." Tooth and Tail will now shift towards a more hand-crafted pixel art style, as evidenced by the screens released earlier today. The game will remain a randomly-generated RTS, in which strategies must be adjusted to suit the level design. There will be numerous units and structures available, but players will only get to use up to seven. Schatz pledges frequent updates on the development front in the coming weeks now that the art style and name changes have been hashed out. The first in-depth look at the overhauled Tooth and Tail is coming later today on Twitch. Schatz and his development team, which includes artist Adam deGrandis, will reveal the overhauled art style at 2PM PT. You can catch that full stream below. No links to old screen shots versus the new ones?